What does this guy actually do? In considering who to look out for in the Aussie team, it’s tempting to look beyond the obvious and think about Pat McCabe in the No12 jersey, the Warwick Taylor-esque straightman to the glittering talents that surround him. What does McCabe actually do, apart from make his tackles? Is he the glue that holds a mentally flakey backline together, a non stats-driven inside centre who allows the players around him to play to their potential, mops up the mistakes and keeps his head down? Or is he a guy who’s nowhere near the level of his talented team-mates and is in because he conforms to a Deans-favoured stereotype? With the ahead-of-schedule return of try-scoring ace Drew Mitchell, is there a case for hot-tempered larrikin James O’Connor to come in off the wing and replace McCabe in the No12 jersey, giving the Australians a huge line-breaking threat off Quade Cooper rather than a pencil-pushing utility back? It sure would make for good TV! In the last couple of years, Robbie Deans has crafted a hugely talented, exciting and young backline. For a while it seemed that Matt Giteau would provide veteran leadership and experience outside Quade Cooper, but that idea was put to rest with his omission from the Australian World Cup squad. Kurtley Beale , Adam Ashley Cooper , Digby Ioane , James O’Connor , Quade Cooper , Will Genia  and McCabe  – these guys have an average age of just over 23 years old. Frightening. While Adam Ashley Cooper is probably coming off his worst international season, he has been the most reliable starter in Deans’ backlines and has rolled up 17 international tries, be it at centre, winger or fullback. Beale has just won the John Eales Medal as Australian Player of the Year for 2011 – his form over the past two seasons in Super Rugby and at international level speaks for itself. O’Connor has been enormous news since making his Super Rugby debut as the youngest player in the history of the tournament and racking up a hat-trick of tries on his international debut against Italy. Ioane is finally past his numerous injuries and producing the kind of rugby on the field that his talent always threatened. Genia and Cooper have gotten over something of a sophomore slump that they suffered last year at international level. The former is clear-cut successor to SA’s Fourie du Preez as best No9 in the world, that rare breed of scrum-half who can run the game better than most international outhalves. Cooper is Carlos Spencer Mk II … but that’s for another day! McCabe is certainly the oddity here – he’s a bit of a grey man amongst the company he keeps. He mostly turned out for the abject Brumbies at fullback, making nine starts there and just two in the No12 jumper. 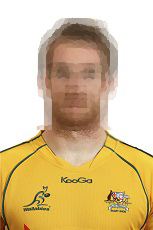 He’s no dummy – he was the Australian 2010 Super Rugby Rookie of the Year – but nor is he exactly a firecracker talent. He plays older and more maturely than his years, a man very much in the Girvan Dempsey mould. Good basics, good physicality, good reader of the game. He’s not a huge man at 186cm [6’1”] and 92kg [14st6lbs] and I don’t think you’re going to see him crashing through many international midfields in the manner of Ma’a Nonu, Sonny Bill Williams, Manu Tuilagi or Aurelien Rougerie, but he does take the ball to the line with good angles, courage and authority, generating quick ruck ball in tandem with Pocock [to clear] and Genia [to pass]. Likewise, he’s a hard-hitting tackler but a technically adept one as well … no swinging arms, no bounces etc. As I said above, any member of the Aussie backline could light up the World Cup: they’re that talented. For that reason, it’s worth keeping an eye out for McCabe, the grey man. Let’s see what he does. This entry was posted in One To Watch and tagged Autralia, Hot-tempered larrikin James O'Connor, One To Watch, Pat McCabe, Razor-sharp incisiveness and inventive lines of running, Robbie Deans, RWC 2011 by dementedmole. Bookmark the permalink. I think that’s a very good assessment of Pat McCabe. What I like about him is his ability to knock people backwards at the gainline which apart from Ant Fainga’a none of the other midfield contenders are capable of. This is crucial to Rocky’s game and for Higgers when he comes off the bench. If they have to trudge sideways or backwards after scrums they’re hamstrung. I also like that when Pat runs he strains every sinew- you can see the effort etched on his face and in his neck. On a final note I’d like to say that he’s a very personable young man and spared some time for us Manly men after we had towelled-up his beloved Warringah in the derby of the peninsula a couple of months ago. Yeah, his basics are exemplary. Even when you see him hitting rucks, he goes in really low with a nice hollow in his back, the ‘neutral spine’ that NZ scrum coach Mike Cron talks about.